Every yard will eventually have an issue with weeds and pests taking over. As a result, many panicked homeowners buy every gardening product under the sun. Unfortunately, these items are often expensive, and they may not entirely solve your needs. Instead, there is a safe, non-toxic answer to many problems at the same time. Professional mulching is among the most frequently requested lawn care services that most customers ask. They know that better mulching comes from Lawn Works, the premier choice for local yard care services. Our mulch is safe, organic wood byproducts and are the best defense to weeds in your flowerbed. You can enjoy the best natural approach to weed and pest control by maintaining a healthy amount of mulch in your landscape beds. Most yard weeds are just not strong enough to grow when they have denser chunks of wood laid on top of them. While some species of bugs prefer to live around bark, most mulch chips are too small to be of any benefit to them. When you’re in need of a straightforward approach to keeping your yard healthy, professional mulching might be the service you need. 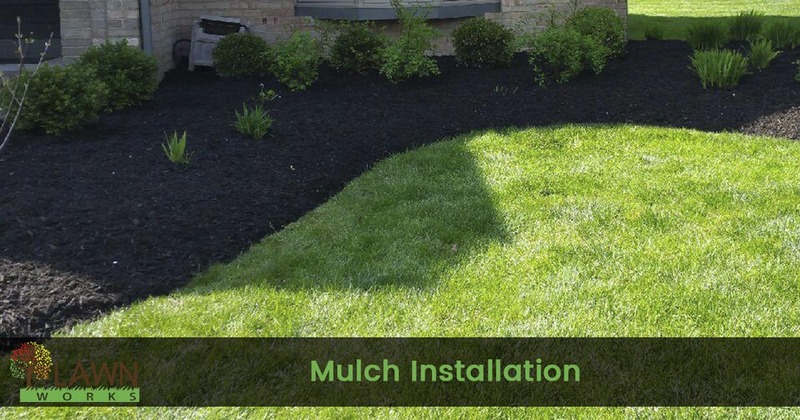 Let us help you maintain the perfect yard with our best mulch application. There are numerous types of mulch available on the market. However, not all mulch varieties are best for your yard. Some mulch installation may do more harm to your yard. Hardwood mulch, for example, tends to be too dense for most plant beds, damaging their stalks and roots along with the weeds. Hardwood is a pricier application, too. Unfortunately, it also loses its color the fastest. Cedar and Cyprus mulches, on the other hand, are less dense and safer for use in most planters. In addition to weighing less, they also tend to retain their nutrients and color longer, requiring less maintenance and new applications. If you are planning on redoing your lawn to adopt more drought tolerant plants, or you intend just to have less grass, decorative rocks may also serve as a type of mulch. Here, the pebbles still fight against weeds, and some species of bugs are damaged by them as well. Mulch may also provide better protection against the cold during winter. The wood can act like down feathers, trapping pockets of air near the roots. No matter the reason you need mulching services, our team is ready to help. We offer fast, reliable mulch application anywhere you need. Mulch looks sharp around the bases of trees, in flower beds and planters, and even in sandy areas where there are no plants. It adds a touch of color and adds a lot of curb appeal to any home. We carry many different mulches and garden fillers in stock, and we’re ready to help you make your yard look its best. Call today for your best local mulching services!